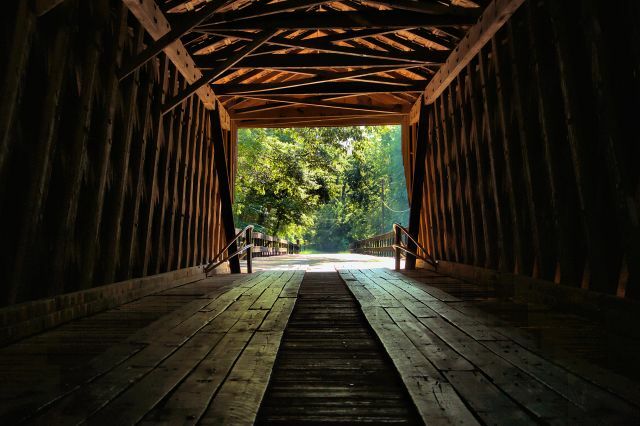 Located in the Imlac Community, near Woodbury and Gay, the Red Oak Creek Covered Bridge is sometimes referred to as the Imlac Bridge. The historical marker erected in 2001 notes: This bridge was built in the 1840s by freed slave and noted bridge builder Horace King (1807-1885). Constructed on the Town lattice design, the bridge’s web of planks crisscrossing at 45- to 60-degree angles are fastened at each intersection with a total of approximately 2,500 wooden pegs, or trunnels. 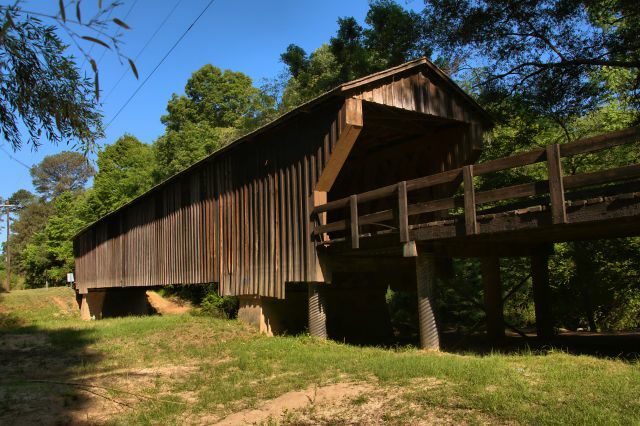 Although King is credited with the construction of many covered bridges throughout west Georgia, this is his only surviving bridge of this design. 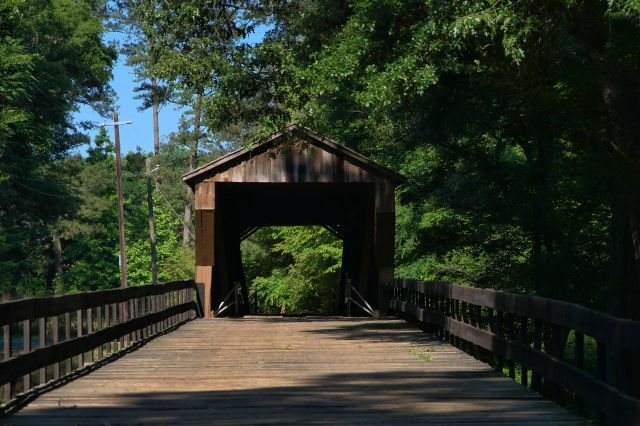 At 391 feet, including the approaches, this structure is the oldest and longest wooden covered bridge in Georgia. 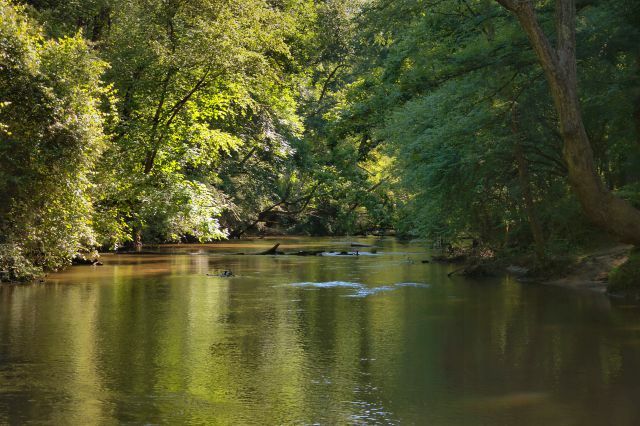 Red Oak Creek is a beautiful tributary of the Flint River. A free public park with picnic tables is located at the bridge for the many who travel here every year. The design of the bridge is known as “Town lattice”, for the criss-crossing beams set in a lattice pattern and pegged at the joints and attached to spliced horizontal timbers which formed the girders for the span. The inventor of this style, Ithiel Town, was a Connecticut architect. He is said to have made a dollar a foot from contractors all over the country who built bridges using his durable design. It was a very popular style. The covered portion of the bridge is 116 feet; its total span is 412 feet. There are approximately 2500 wooden pegs holding the truss together. For more, see the National Register nomination form. Horace King was born a slave in South Carolina in 1807. He was given his freedom in 1848 by his master, John Godwin, but continued to work for him. Godwin was a contractor and his jobs often needed the skill of King. 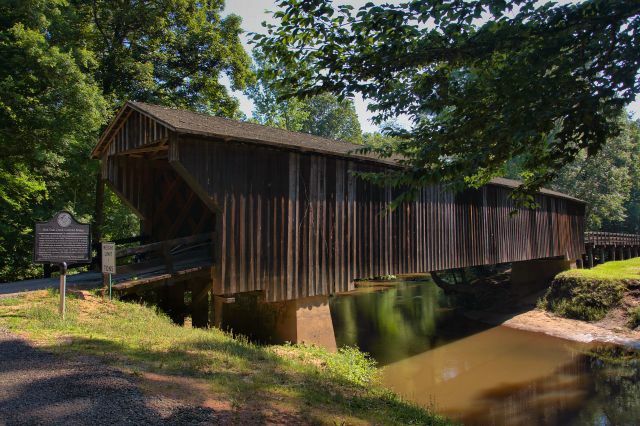 King built a bridge spanning the Chattahoochee at Columbus, and later moved to the LaGrange area, where he was responsible for the construction of numerous covered bridges. His sons (John, Marshall, & Washington) followed him in this trade.